In the indigenous language Moyogalpa means "place of mosquitos." Moyogalpa like many of the towns along the island the people of Moyogalpa mix indigenous traditions, European, and Catholic traditions. There is no time when this is better displayed than during the patron saint's festival. Moyogalpa's festival is known for el baile de las Inditas. This dance is supposed to represent the relationship between the indigenous people of Nicaragua and the Europeans and the combining of the two cultures. The woman represents the indigenous while the man represents the dance. The dance represents the relationship as one filled with love, respect, and chivalry, although not necessarily equality. There are plenty of places to stay in Moyogalpa from high end hotels to renting a hammock on a balcony. The locals are very friendly and welcoming to the 40,000 plus visitors they receive every year. Most visitors either take the apollo bus (often mistranslated as "chicken bus" in English) or they rent a scooter or motorcycle to get around. There are multiple ferries and lanchas that run throughout the day, every day, including holidays. The majority run from San Jorge Ferry Port to Moyogalpa, however some run to San José del Sur. Ferry hours are seasonal and somewhat weather dependent. The majority of people do not bring their vehicle across to the island, they travel on the ferry's or lancha's on foot. The majority of vehicle traffic is commercial in nature. A reservation 5 days in advance is recommended if you are bringing a vehicle across in the busy season (mid-November - mid-May). 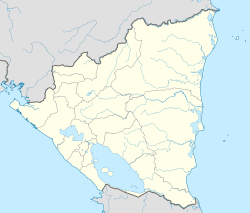 ^ "Ometepe Island Info - Getting Around On The Island". ometepeislandinfo.com. Retrieved 2017-02-06. ^ "Ometepe Island Info - Please Read Before Taking The Ferry's and Launcha's". ometepeislandinfo.com. Retrieved 2017-02-06. Wikimedia Commons has media related to Moyogalpa. This page was last edited on 16 January 2019, at 16:33 (UTC).